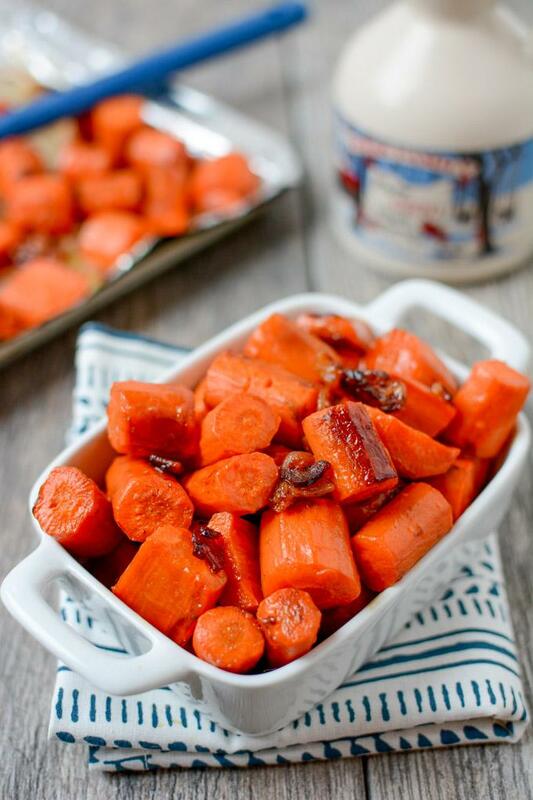 This recipe for Maple Bacon Roasted Carrots is made with just three ingredients and makes the perfect sweet and savory side dish. Super easy recipe alert! In fact, I hesitate to even call this a recipe because it’s just so darn simple! It’s literally just 3 ingredients. Chop, shake, roast, eat. That’s all there is to it. I made these to go with the Crockpot Cheesy Chicken and Potatoes we ate the other night. They’re great straight out of the oven but they also reheat well. I love the subtle sweetness from the maple syrup…and we all know everything tastes better with bacon! Next time, I might add a little cayenne pepper to give them a little sweet & spicy kick! 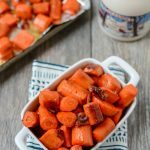 This recipe for Maple Bacon Roasted Carrots is made with just three ingredients and makes the perfect dinner side dish. Peel and chop carrots into one inch long chunks. Try to choose carrots that are similar thickness so that they cook evenly. If parts of them are much thicker, you may want to cut those chunks in half lengthwise. Add maple syrup, bacon and carrots to a large bowl and shake or stir until well-coated. Place on foil-lined baking sheet and roast at 400 degrees F for 20-30 minutes, stirring once. Check after 20 minutes to see if desired tenderness is reached. If not, return to oven for another 10 min. Feel free to add some cayenne pepper if desired! Are you a carrot lover? What’s your favorite way to eat them?! 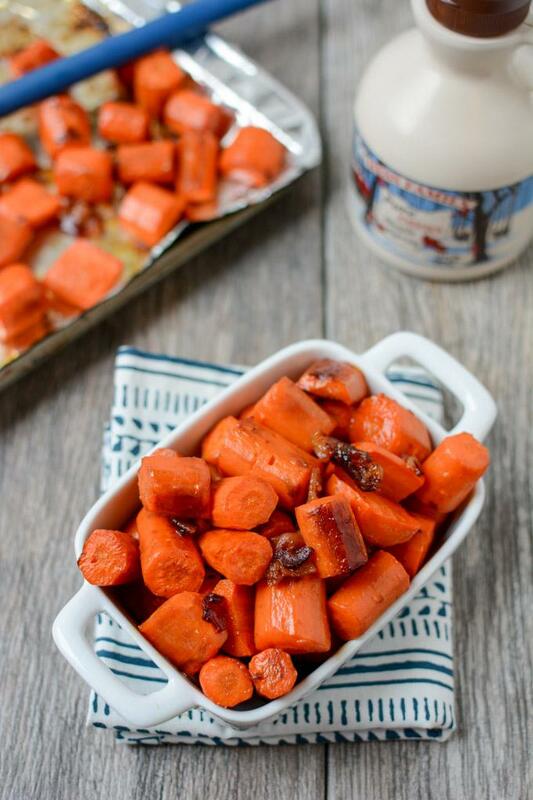 Serve these Maple Bacon Roasted Carrots from @Leangrnbeanblog with dinner tonight! Is the bacon supposed to be already cooked or raw? So I’m not a huuuuge fan of cooked carrots (usually just eat them raw), but I wouldn’t be able to pass up these flavored carrots. What a great combination! My hubby is recently obsessed with cooked carrots. I’m a fan of all things cruciferous myself but add maple and bacon and I think you could make a cooked carrot lover out of me yet! Um, these sound amazing!! Pinning 🙂 Thanks! 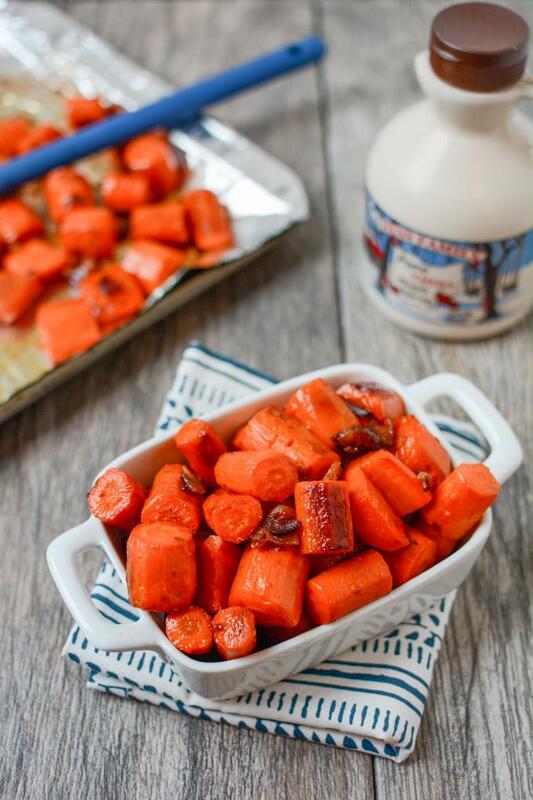 These carrots look seriously delicious with the maple and bacon flavors. I’m going to try making it next week. Anything with maple in it and I’m there! This is so, so yummy! This is the second time that I have made this dish. Both times I have used a pan and just sauteed everything together instead of roasting. (No extra oil needed.) Make sure to double the recipe because it is so easy and everyone loves it! So I’m going to try this tonight along with cheesy chicken and potato recipe. One question. My family prefers frozen veggies. Could I use the frozen crinkle cut carrots instead of fesh? i’m not sure how it would go trying to roast them if they’re frozen. maybe cook them first and then roast them for some additional flavor? Okay, thanks! Sorry. New to the cooking g for a family thing. Also another question for the cheesy chicken another potatoes in slow cooker,.. does it matter what cheese I use, I have velveta, and mozzarella. Which do you recommend? Thankyou! This recipe says ONE serving. Is that correct? oops! that’s a default setting and i guess i forgot to fill it in. just updated it to 4!